The NCSoft financial report for the latest quarter has just been made public. On the surface, it looks amazing. Net sales nearly tripled from Q2 to Q3, but that’s entirely due to one segment — and it might make some others obsolete. First off, Guild Wars 2 has been in the news recently, and not in a positive way. Now we can see that the latest quarter, which saw the launch of the newest expansion, Path of Fire, only boosted sales up to 20,145 million Korean won (mKRW), which is about on par with what the game was pulling in during its long content drought prior to the release of the first expansion, Heart of Thorns. Granted, the base version of PoF cost $30, as opposed to $50 for HoT, and it was only on sale for one week at the end of Q3, as opposed to just over two months for HoT, but it still can’t be taken as a positive sign. But that might be the case across all of NCSoft’s MMOs. With the exception of Lineage, which posted a small gain, everything else is down (not counting WildStar, which we don’t know about). So, NCSoft is struggling, right? Nope! 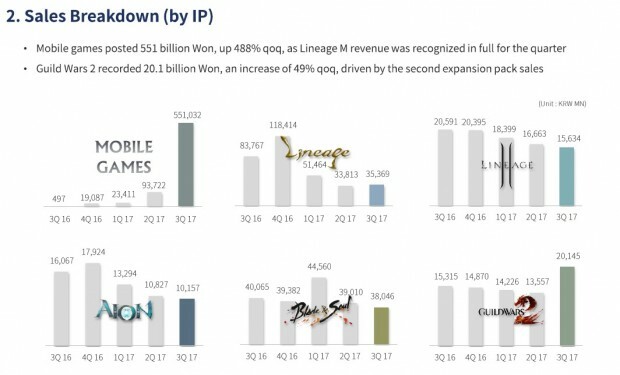 Revenue from NCSoft’s mobile games, primarily Lineage M, was absolutely bonkers in Q3, to the tune of 551,032 mKRW. That alone is more than the entire company made in the first six months of 2017. Add that to the 93,722 mKRW mobile games made in Q2, and you get more than either Guild Wars 2 or Blade & Soul have brought in — during their entire five-year lifespans. Now, I don’t want to be too gloom-and-doom, but a tidal wave of income like this is the sort of thing that companies completely change their vision for. Non-mobile games in total still brought in 1/3 of NCSoft’s revenue for the quarter, so I wouldn’t expect them to go away completely, at least not the highly successful ones. But WildStar? Or Guild Wars 2 if it doesn’t improve? 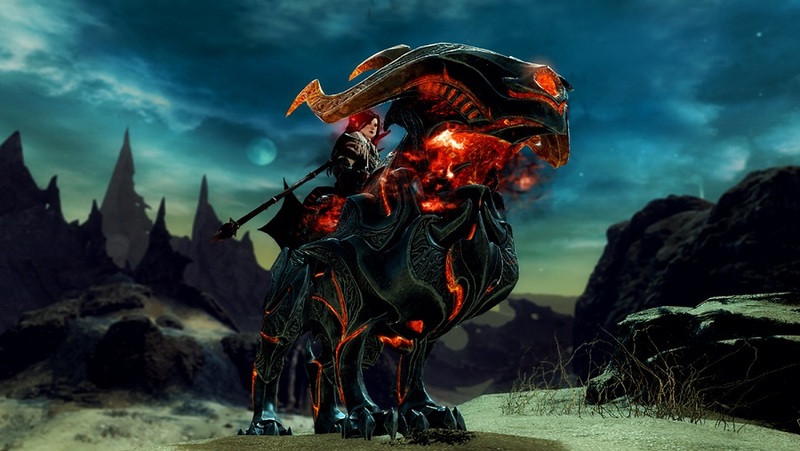 If Q4 continues the trend of “mobile up, MMOs down,” things could get very interesting. You can download the NCSoft Q3 financial summary on the company’s Investor Relations page. Reason why Mobile Games are so over the top results is because it doesn’t have IP block, or limiting us with massive Pings to make the game unplayable, if they focused more on the Countries THAT DO care about their games let say like SEA server with English clients and PING that’s lower than 200-250ms would greatly increase their sales exponentially, and im basing this off on a number of forums that have SEA players going left and right at other language games in KR TH JP and TW and building English Patches just to play the damn game. They don’t need to rethink market wise, they need to RE THINK the countries they place service on, lets face it North America tends to do FIRST PERSON SHOOTER more than MMORPG’s, then just give them FPS and give us SEA PLAYERS MMORPG’s!